BBFC Consumer Advice:Contains strong language, moderate violence and horror. This film contains a sequence of flashing lights which might affect customers who are susceptible to photosensitive epilepsy. "In space, no one can hear you scream..."
In a remote region of the galaxy, the United States space tug, Nostromo, carrying a cargo of mineral ore, makes its return journey to Earth. The ship’s crew -five men, two women and a cat -are awakened from their hypersleep chambers when Mother, the on-board computer, monitors a strange transmission. According to Company law, the crew must investigate any signal indicating possible intelligent life. What begins as a routine search mission quickly escalates into a nightmare of unimaginable terror when the crew discovers and brings aboard an extraterrestrial life form. 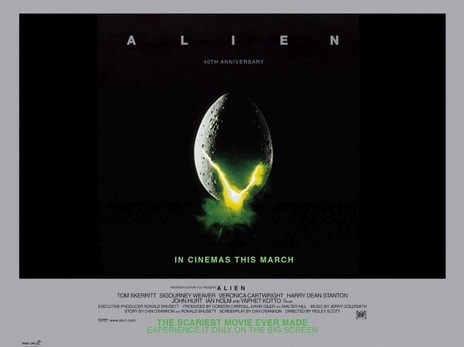 Directed by Ridley Scott, with alien design by renowned artist H.R. Giger, the horror classic ALIEN pits man and all of his technology against a single fearsome creature with violent and deadly survival instincts. As each of Nostromo’s crewmembers are killed off one by one, the dwindling survivors uncover a sinister conspiracy that doomed them before they ever left Earth.